The Environment Protection Authority (EPA) is now the appropriate regulatory authority (ARA) for large-scale wind farm premises under the Protection of the Environment Operations Act 1997 (POEO Act). Operators of these wind farms must now hold environment protection licences for both construction and operation (transitional provisions apply). The changes have been implemented through the Protection of the Environment Operations Amendment (Scheduled Activities) Regulation 2013 (the Amendment Regulation), which commenced on 28 June 2013. 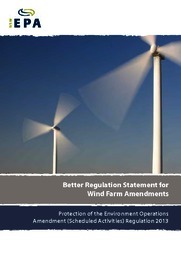 The questions and answers on wind farm regulation explain the changes in detail. The Better Regulation Statement explains the background and development of the wind farm amendments contained in the Amendment Regulation. The Amendment Regulation also includes changes to bring all coal seam gas activities (exploration, assessment and production) into the EPA’s licensing regime. The coal seam gas page provides further information about the EPA’s role in regulating the coal seam gas industry. the need for protocols between the Department of Planning and Infrastructure (DP&I) and the EPA. The questions and answers address many of these issues. Two submissions stated some opposition to the proposed wind-farm amendments. However, the EPA believes the issues they raised can be addressed during implementation. Three minor amendments of a technical nature were made to the proposed wind farm amendments following consultation. All other matters raised in submissions can be addressed during implementation. More detail on the consultation process, the issues raised and the EPA’s response can be found in Section 6 of the Better Regulation Statement. The questions and answers help explain the changes and what they mean for the regulation of wind farms in NSW. They also address some of the issues raised during consultation. The EPA will write to key stakeholders and those who made a submission during the exhibition period.